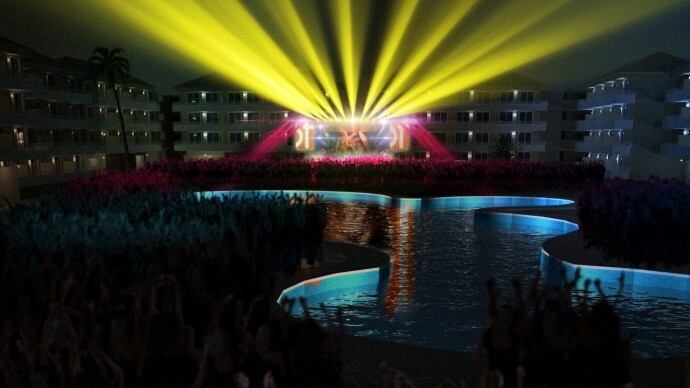 BH Mallorca is a brand new hotel coming to the beautifully and internationally renowned party paradise that is Mallorca. It is to be a perfect, all in one, party solution that offers great outdoor dance music events, plenty of water park based fun and lots of luxurious rooms in which groups of friends can spend entire weeks having the times of their lives. As well as lots of nighttime activities, there will be plenty to do in the day, which will stand BH Mallorca out from the current crowd. Taking over what was formerly Mallorca Rocks, BH Mallorca is looking to totally change the game with a 10 million + euro refit and there will be no expense spared on making it the ultimate place to party from May 2015 onwards. The line-ups will be announced in the coming weeks but think big, and expect only the most in demand names from the worlds of EDM, house, techno, urban, bass, hip hop and more. All the talent will be booked by Danny Whittle & Mark Netto – ex Pacha Ibiza – and Gordon Phillips of BCM fame. BH Mallorca is sure to rival celebrated world greats like Ushuaia in Ibiza by offering a clubbing experience that also offers nine “white knuckle” slides in the over-18s water park, a wave pool and three jacuzzis, and suites with a beach club view, stage view, pool view, water park view and street view. Every well appointed suite will have walk in showers, will sleep four people in two twin beds and two bed sofás. Suites will also be kitted out with two full length mirrors, a flat screen TV with English channels and cable to plug in devices and also a hairdryer and fridge. They all have balconies and are sure to offer the perfect place to relax and regenerate yourselves before heading back out to the party. STAGE’ live event arena will bring you the World’s biggest DJs not once but twice – every week! Boasting a state of the art sound system and cutting edge production, see the biggest acts in Electronic Music perform live in Mallorca’s only open-air festival venue. Programmed by the same company that brings you BCM Planet Dance expect nothing but the best for Summer 2015. Guests at BH Mallorca will have unlimited access to all three areas included in their stay, with food and drinks included between 11am and 8pm, meaning that essentially what BH Mallorca are doing is offering a full day experience and a full night experience all in one venue. When guests book their holiday they have everything they need in terms of entertainment included so people know exactly what they are paying for, and how much, up front.